We continue our occasional Friday series, Recommended Reads, which looks at book recommendations for children and young adults, with R.J. Palacio's critically acclaimed Wonder. Awards: Wonder has received laudatory reviews and awards too numerous to list, but which can be found on the website of its publisher, Random House. Plot: Wonder tells the story of August Pullman, a pretty typical ten-year-old—on the inside. But Auggie was born with a dramatic facial deformity, so serious that he has never been able to go to school because he’s been in and out of the hospital for surgeries (27 of them so far) and needed constant medical attention. But the year he turns ten, he nervously enters a school for the first time on the first day of fifth grade. Auggie’s year is rough in a lot of ways. All he wants is to blend in, but with a face like his, that’s impossible. Some of the other kids tease him behind his back, and most others simply avoid him. But gradually Auggie’s sweet disposition, intelligence, grit, and wicked sense of humor start to win over some of his classmates. Our Take: Holy cow. Stop whatever you’re doing and read this book. Now. Buy a copy for every kid you know. In fact, buy a copy for every adult you know, too. Wonder is one of the most compelling books we’ve read in a long time. This story is sometimes funny, sometimes heartbreaking, and always uncannily real - so real that it’s difficult to believe that R.J. Palacio is a normal-looking adult woman and not a boy with craniofacial abnormalities. Auggie is brave but still very human and fallible, as are his parents who struggle to walk the line between shielding their son from the cruelty of the world and being over-protective. Very vivid portraits of other people in his life, like his sister and kids in his class, accompany Auggie’s in this character-driven book. 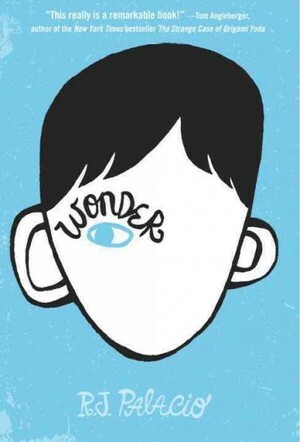 The first part of Wonder is told in first-person from Auggie’s perspective, but then, without warning, the narrative is taken over by various family members and friends before turning back to Auggie again. The result is a rich, nuanced portrait of Auggie’s experience, allowing the reader to walk around in Auggie’s skin but also to come to know him from the more objective perspective of others as well. This is the kind of book that will cause kids to wrestle with big, abstract themes like compassion, indifference, friendship, popularity, growing up, and fitting in versus standing out. Auggie’s attitude as he plays the tough hand life dealt him is inspirational. As it turns out, he’s a beautiful person.